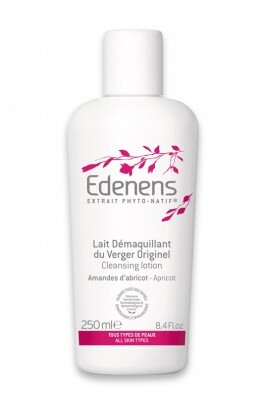 Edenens Cleansing Lotion Verger Originel delicately removes impurities and makeup, even long-wear and waterproof formulas. Its texture envelops skin with an exquisite feeling of comfort, leaving a silky smooth finish. Apricot Almond Oil smoothes skin while Phyto-Native Extract feeds skin cells with essential nutriments : peptids, amino acids, minerals. Edenens Cleansing Lotion Verger Originel ultra-mild composition is ideal for sensitive skins. Skin tolerance tested under dermatologist and ophtalmologist control. Apply day and night Edenens Cleansing Lotion Verger Originel on face and eyes using a cotton pad. Complete the cleansing routine using Edenens Refreshing Toner Rosée Désaltérante. Rinsing is optional.